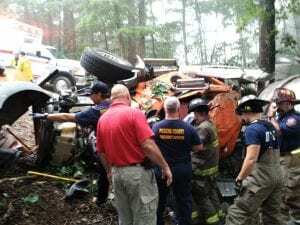 PICKENS COUNTY, Ga. – A cement truck overturned on Rimrock Road just inside the Pickens County line Monday, Aug. 20, at approximately 9:25 a.m.
Hospital by Pickens County EMS for further evaluation of his injuries which are not believed to be life threatening. This incident is being investigated by Georgia State Patrol. This alife-threatening an automatic mutual aid agreement with Dawson and Pickens counties assisting each other. Dawson County Stations 1, 6 and 8 responded. Photos were taken by Jason Dooley, Dawson County Fire and Emergency Services.